Josephine Nkrumah is the chairperson of the National Commission for Civic Education. The Assistant Director of the Programmes Department at the National Commission for Civic Education (NCCE), Imurana Mohammed, recommended for an initiative to be established to retrieve illegal arms within militia groups. “We also want constitutional reforms on the security of all agencies and we want the courts to impose maximum sentences for groups who engage in political violence,” Mohammed told a pool of reporters. In the long term, he added, the Commission is imploring the government to develop robust employment strategies to eliminate people from forming and/or joining such groups. “Kingpins of political parties who sponsor vigilante [militia] groups should withdraw their sponsorship of these groups and instead channel that funding into sustainable employment avenues for the youth in these groups,” he continued. He recommended that the NCCE be adequately resourced to perform its mandate effectively, adding that the Electoral Commission should reconsider the revival of the Political Parties Code of Conduct with an emphasis on fighting the formation of militias. An increased interest in the Ghana Police Service’s resource allocation would further alleviate the canker. “Over the years, the level of violence that has become the hallmark of the activities of party vigilante groups during each phase of the electoral cycle, has increased since Ghana’s transition to constitutional rule in 1992,” the statement continues. 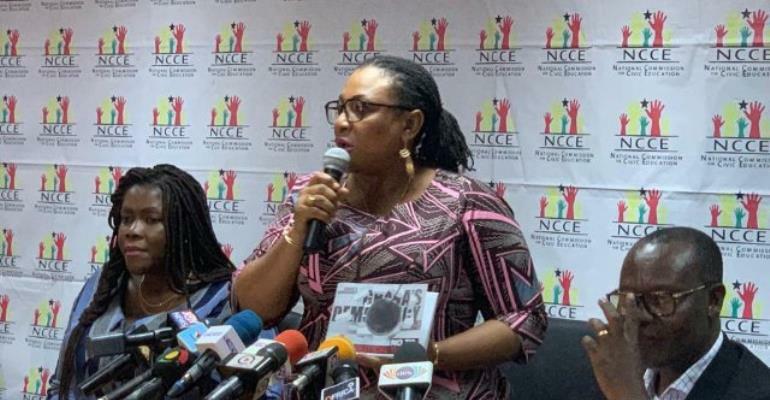 The report further stated that the NCCE seeks to collate stakeholders on their perspectives on factors that trigger political violence and solicit support for a coalition that would mount pressure on political parties to disband these groups. Militialism has become an erosion of Ghana’s democratic gains, the NCCE warned and solving the problem will require efficient armistice means to ensure a sustainable democracy. The NCCE consulted with the following groups: the New Patriotic Party, the National Democratic Congress, the Ghana Police Service, the Peace Council, the Trades Union Congress, Office of the National Chief Imam, the Speaker of Parliament's Office, The Ministry of National Security, the Christian Council, the Commission on Human Rights and Administrative Justice and the Judicial Service of Ghana.